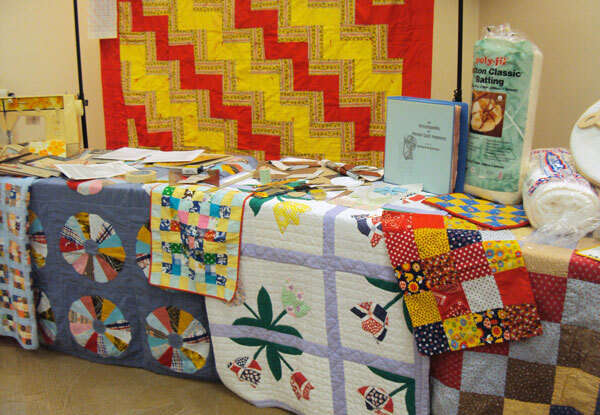 Nowadays it seems that the books that are being published about quilting in particular, and perhaps other textile arts in general, are along the lines of “Make a Quilt in a Day”. It’s all about speed, about making more and more items – productivity seems to be the sought-after achievement. What’s driving this need for speed? Back in the days of the 1970s quilt revival, not only did we have just a few books setting out how to make our quilts – and if we didn’t want to use the designs they supplied, we worked out designs on graph paper. Now, everyone can do it faster and better by searching out tutorials on the web; furthermore, traditional quilters have electronic programs to work out individual designs, and contemporary quilters can use photos and so much else. It’s really exciting, this augmented world of possibility – but is it just too exciting? Are quilters (of whatever categories and persuasions) being misled by being pushed into always doing the next new thing, and into the need for instant gratification? Or is it that through this exposure we have accumulated so much in our brain that we want to do, and doing it quicker will mean we succeed in our goal of producing as much as we can? We chose our own path and focus, of course, and there will always be a bandwagon effect that makes it hard not to jump on to the newest fad. 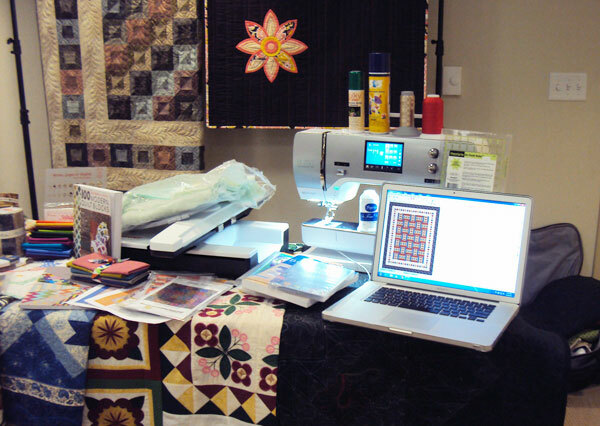 For many people, though, quilting is a way to escape the frenetic pace of social media, constant information, lack of a work-life balance, and similar modern ills. In trying to make it easier (and quicker) for ourselves, it’s hard to get away from using other people’s patterns, drawings, photos, instructions – they get us to the point where we can get on with “just making”. No further decisions need be made, the project will not falter or stall because of indecisiveness … only because of diminishing interest or lack of time. Even for the artist/designer who turns quiltmaker, the many decisions needed to get as far as the “making” stage can sometimes be daunting. Have you had an idea and worked it up on paper or in samples, but not started the actual making because it seems that finishing this huge quilt will take too much time, time that you’d subconsciously allocated to several other projects as yet unvisualised? And could this be because, deep down somewhere, you’re not all that sure that this particular project, despite all your preparation and care, will turn out the way you want it to? Is it too big a risk to make the commitment? For some people, the focus is on production and results. For others, their pleasure comes from the process – they simply love the making. For all of us, we work at different speeds – sometimes we really do need a quilt to be ready tomorrow; for example, a long-planned project to welcome a baby can suddenly jump to the top of the list. The Slow Textiles movement is embraced by some quilters but it’s definitely not in the mainstream that publishers are feeding with “quilt in a day” books. Another hopeful sign is Modern Quilts, makers who are taking quilting back to its roots – not just by rediscovering the patterns and techniques that got the resurgence in quilting going in the 1970s, but by using the methods of those times – planning on graph paper and hand quilting among them. Taking your time when making textile work emphasizes, quite rightly in my opinion, the sense of connection that is always inherent in cloth: connection with the body, with warmth, with continuity, with care. Connection of the maker with the fabric and with the intended use of the new item, and with its users. 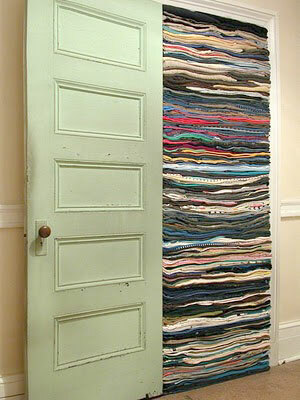 Connection with old cloth and its history, including the history of its making and of its maker. Arguably, productivity is over-rated. Less can be more: more care, more satisfaction. 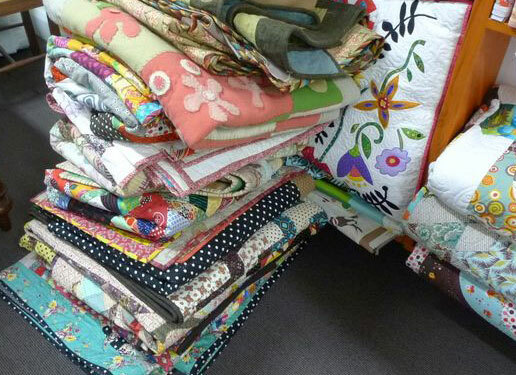 And yet, and yet – the proliferation of books, techniques and supplies means that specialist shops (and teachers) can make a living out of quilting. The availability of so many patterns and kits means that beginners, or people unsure of colour choices or unwilling to burden themselves with a large stash, can derive the satisfaction of making, and express their need to make something beautiful.